Well.. Dissonance is the project to continue developing Consonance, and its result is Pragha Music Manager. A New reproducer of music. Full integration with GTK+3, but always completely independent of gnome or xfce. Playing and edit tag of mp3, m4a, ogg, flac, asf, wma, and ape files. Limited only by codecs installed and taglib version used. 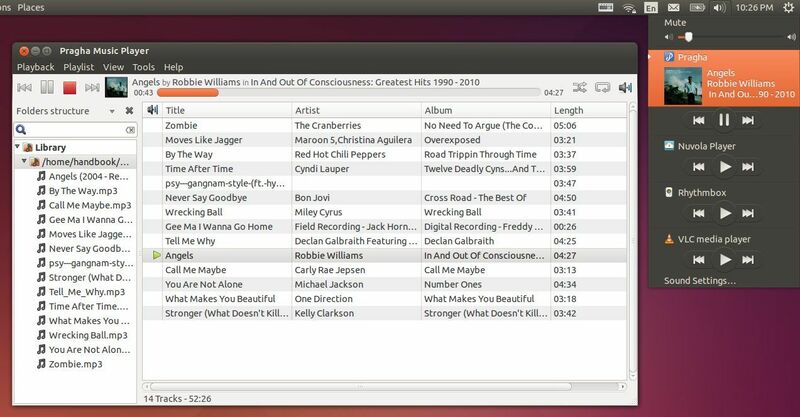 Seems that there’s no apt repository for Ubuntu users to make it easy to install the player, so I built the latest v1.2.2 into my PPA, available for Ubuntu 14.04, Ubuntu 12.04, Ubuntu 14.10 and their derivatives. UPDATE: Remove Ubuntu 12.04 support due to broken packages in gstreamer PPA. Add Ubuntu 14.10 Support. Sorry that the Ubuntu 12.04 build excludes libglyr (>= 1.0.1) which allows to get lyrics and artist bio over many internet services, and download missing album cover art from Last.fm. Please email me if you know how to build libglyr for Ubuntu 12.04 Precise. Great NEWS. Pragha is my favorite database oriented audio player. Up to now I used the 1.1.1-1 release available via getdeb.net. Upgrade to 1.2.2 worked perfectly.